GSM SWITCH GS300 KIT - IQtronic technologies Europe s.r.o. 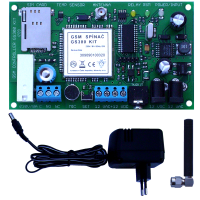 GSM SWITCH GS300 KIT is the same like GS300, but there is no MicroRelay output. GS300 KIT has increased tapping quality and temperature measuring accuracy. GS300 KIT has connector for extarnal GSM antenna. Output relay is flip-flop, stand-by consumption is only 0.36 Watts. Delivered with power supply and external antenna.